Thanks for popping by, I wanted to share with you some projects I've created recently & a few especially for this blog post. 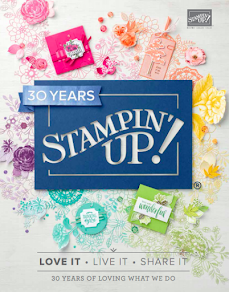 At Stampin' Up! we get to go to events for training, achievements & creating with upcoming new products. As part of the event demonstrators get picked to either be display stampers or showcase on the stage what is new as well as tips for the rest of us demonstrators. So, I thought I would put myself forward to be a display stamper, I've created 3 card fronts, 2 3-d projects & a scrapbook page.